* Whitson was given a three-month extension mid-flight. She flew into space Nov. 17, 2016, aboard Soyuz MS-03 and landed with the Soyuz MS-04 crew on Sept. 3, 2017. Over two months, the five-person crew — NASA astronauts Peggy Whitson and Jack Fischer; Russian cosmonauts Oleg Novitskiy and Fyodor Yurchikhin; and European Space Agency astronaut Thomas Pesquet — oversaw two spacewalks and a single cargo ship arrival. Additionally, among the dozens of experiments performed during their stay the crew studied the microorganisms present aboard the ISS and measured the charges of cosmic rays. At 07:57 UTC April 10, 2017, Expedition 51 officially began when Soyuz MS-02 with its three-person crew undocked. Remaining at the International Space Station to form the first part of Expedition 51 were NASA astronaut Peggy Whitson, Russian cosmonaut Oleg Novitskiy and European Space Agency astronaut Thomas Pesquet. Commanding Expedition 51 was Peggy Whitson. She had also recently been given a three-month extension to her mission and would not depart in Soyuz MS-03 with her other two colleagues at the end of this crew increment. 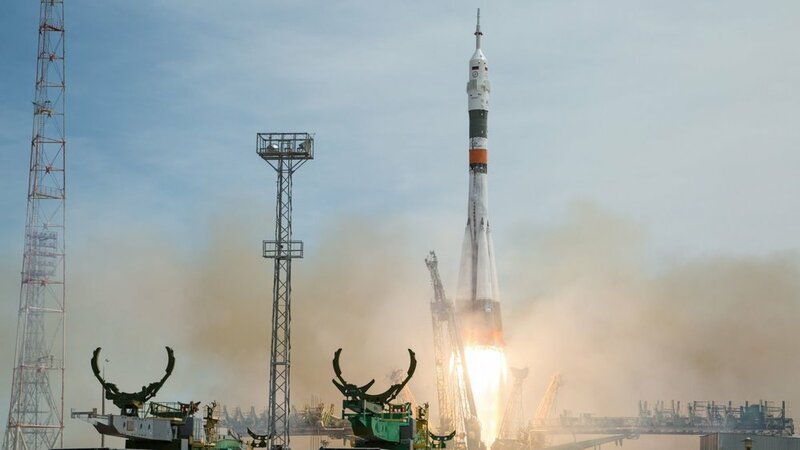 Ten days later, Soyuz MS-04 would launch from Baikonur Cosmodrome in Kazakhstan with Russian cosmonaut Fyodor Yurchikhin and NASA astronaut Jack Fischer. 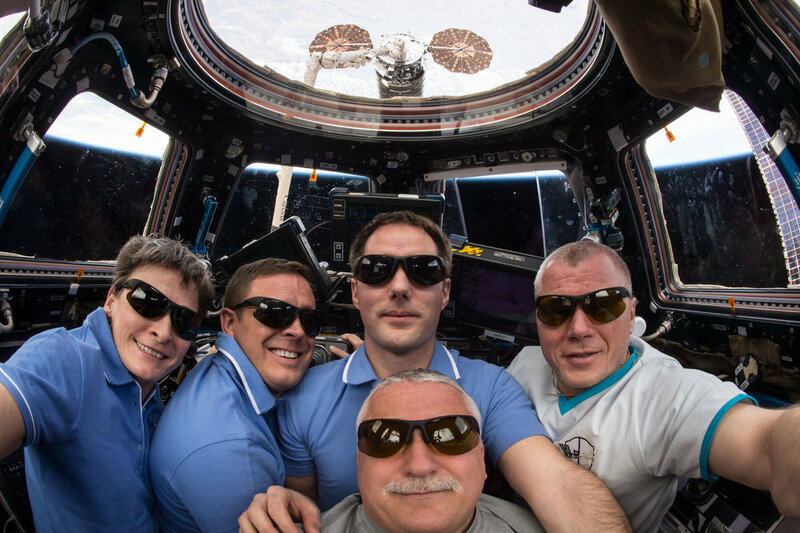 Whitson would land with this crew at the end of Expedition 52. Liftoff atop a Soyuz-FG rocket took place at 07:13 UTC April 10, 2017, with a docking just over six hours later at 13:18 UTC. The Soyuz mated with the Poisk module where it would stay until Sept. 2. This was Yurchikhin’s fifth spaceflight and Fischer’s first, and only as he would retire from the space agency in May 2018. The first major visitor to the ISS during Expedition 51 was the S.S. John Glenn OA-7 Cygnus spacecraft. The resupply mission brought with it some 3,400 kilograms of cargo, crew supplies and experiments. Liftoff took place at 15:11 UTC April 18 atop a United Launch Alliance Atlas 5 rocket from Cape Canaveral Air Force Station’s Space Launch Complex 41 in Florida. Four days later, it rendezvoused with the outpost. After it was captured by the 17.6-meter robotic Canadarm2 at 10:16 UTC April 22, the craft was then moved to the Earth-facing port of the Unity module on the U.S. side of the station. The cargo aboard Cygnus included many new experiments such as the Advanced Plant Habitat, which is a fully enclosed, environmentally controlled compartment that is used to perform plant bioscience research. The container box is 45 centimeters on each side and is covered by a plastic top. Also on board was the Magnetic 3D Cell Culture for Biological Research in Microgravity investigation. As the name suggests, it was designed to test magnetized cells as well as tools that might make it easier to handle cells and cultures. Another experiment was SUBSA, or the Solidification Using a Baffle in Sealed Ampoules investigation. It was designed to study the processes involved in semiconductor crystal growth. Cygnus would remained attached to the ISS until June 2, 2018. In May 2017, two spacewalks were performed. One was planned, while the other was a contingency. The first, U.S. EVA-42, was performed May 12 by Whitson and Fischer and was the 200th outing by astronauts in support of ISS assembly and maintenance since 1998. Originally planned to be 6.5 hours long, it was cut short to just 4 hours, 13 minutes after problems during preparations for the excursion delayed the start of the spacewalk by more than an hour to 13:08 UTC. The primary tasks for the spacewalk included replacing an avionics box on Express Logistics Carrier 4, repair insulation on the Japanese robotic arm on the Kibo module, the installation of a data collector on the Alpha Magnetic Spectrometer and installing a debris shield around the base of Pressurized Mating Adapter 3, which was recently relocated in preparation for the eventual arrival of International Docking Adapter 3 sometime in 2019. U.S. EVA-42 concluded at 17:21 UTC. Just a week later, a data relay box on the outside of the outpost failed. It was a key piece of equipment that necessitated a contingency spacewalk. Called a multiplexer-demultiplexer, the unit primarily controls the functionality of the space station’s massive solar arrays, radiators and provides power to various other components. It is one of two fully redundant boxes on the S0 truss segment. U.S. EVA-43, as it was known, was also performed by Whitson and Fischer. It started at 11:20 UTC May 23, and saw the duo do separate tasks. Whitson was responsible for the multiplexer-demultiplexer while Fischer went to work on installing two antennas that were planned for the previous spacewalk before it was cut short. Removing the relay box was pretty straight forward. It unbolting the box, removing it and visually inspecting the connectors. The connectors were clean, indicating to the ground that the failure was not likely the result of an electrical arcing to cause a short. The installation of the spare box, while essentially the opposite of removing the failed unit, required a little extra work. Eventually, it was installed and engineers on the ground verified it was healthy. Once both back inside the Quest airlock, Fischer closed the hatch and re-pressurization began, officially ending EVA-43 at 14:06 UTC for a total of 2 hours, 46 minutes of spacewalk time. This contingency spacewalk was the sixth EVA from Quest in 2017 and the 201st overall in support of the ISS assembly and maintenance, the first occurring in December 1998. On June 2, 2017, it was time for Soyuz MS-03 to return to Earth with its crew—cosmonaut Novitskiy and ESA astronaut Pesquet. Whitson had launched in the spacecraft with the duo back in November 2016. Because she was given an three-month extension to her mission, her spacecraft seat liner was removed and transferred to Soyuz MS-04, which she would return to Earth inside in September. Whitson, along with Yurchikhin and Fischer, stayed behind to form the first part of Expedition 52. Whitson handed command over to Yurchikhin. Undocking of Soyuz MS-03 from the Rassvet module occurred at 10:47 UTC. Landing took place several hours later at 14:10 UTC. The total mission time for Novitskiy and Pesquet was 196 days, 17 hours and 49 minutes. Once on the ground, the Soyuz flipped onto its side, which sometimes happens, as the wind can catch a landed spacecraft’s’ parachutes and drag the whole vehicle. Once the chute was cut loose by pyrotechnics, however, the spacecraft came to a complete stop. While that occurred, helicopters, as well as search and rescue teams, arrived in the area to begin extracting the crew. The first to be carried out of the capsule was Novitskiy, then Pesquet. They were both carried to couches for initial health checks and water. After that, they were carried to an inflatable medical tent for more checks and to change out of their landing suits. Once everything was completed, the two space flyers were placed in a helicopter and flown to nearby Karaganda, Kazakhstan, where they went into separate planes to head to their respective space agencies. Landing on the Kazakh Steppe, two members of the International Space Station’s Expedition 51 crew returned to Earth on June 2, 2017, after spending 196 days in orbit. Russian cosmonaut Oleg Novitskiy and European Space Agency astronaut Thomas Pesquet landed in their Soyuz MS-03 capsule about an hour before sunset local time at 8:10 p.m. (10:10 a.m. EDT / 14:10 GMT). Just three days after the failure of a key data relay box, a contingency spacewalk was planned by ground teams and executed by International Space Station astronauts Peggy Whitson and Jack Fischer to replace the component. A data relay box failure outside the International Space Station has prompted mission managers to begin planning a contingency spacewalk. On Tuesday, May 23, 2017, NASA astronauts Peggy Whitson and Jack Fischer will venture outside the Quest airlock to replace the failed component. For the 200th time in nearly two decades, two people aboard the International Space Station donned spacesuits and ventured outside to perform a spacewalk. Problems during preparations for the excursion, however, ultimately caused it to be cut short by more than two hours. After a four-day cruise to the International Space Station, Orbital ATK’s OA-7 Cygnus spacecraft, named S.S. John Glenn, was captured and berthed to the outpost. Capture of the 6.4-meter long spacecraft by the station’s robotic Canadarm2 came at 6:05 a.m. EDT (10:05 GMT) April 22, 2017. Expedition 51 Flight Engineer Thomas Pesquet of the European Space Agency as well as Commander Peggy Whitson of NASA were at the Robotics Work Station in the Cupola window controlling the arm. NASA astronaut Peggy Whitson’s stay aboard the International Space Station has been extended by three months through Expedition 52, adding to her already record-breaking mission. Instead of returning to Earth in June 2017 with the Soyuz MS-03 capsule she launched in along side Russian cosmonaut Oleg Novitsky and European Space Agency astronaut Thomas Pesquet, 57-year-old Whitson will remain aboard the ISS and fly home in September 2017 with the crew of Soyuz MS-04, which will have a vacant seat.